Met2 Cafeteria on the top-level of the iconic Woolworths at Town Hall Station, is not only a rare find but also a blast from the retro past. It reminds me of my childhood in the 1970’s when I ate salty crinkled cut hot chips in a bucket that I put on a plastic tray and slid along the cold stainless steel rungs to the cashier in the yellow uniform. That was at the Coles/K Mart in Waratah, Newcastle, and I wonder if it’s still there? Like American diners, supermarket cafeterias are nostalgic bolt holes and Met2 is the only one in existence that I know of. Sitting serenely atop the busiest Woolies in Australia – well, definitely Sydney – the café shares a floor with a photo lab and a kind of Internet café and whatever Woolies is trying to spruik that week. Not many people know about it, as most don’t make it past the ground floor. There are booths and a menu that reads like RSL restaurant menus, think chicken vol-an-vont, fish Mornay and all types of steaks, and I love it. If only the staff dressed in pastel coloured uniforms that were so popular in the 70s and 80s, which would really top it off! 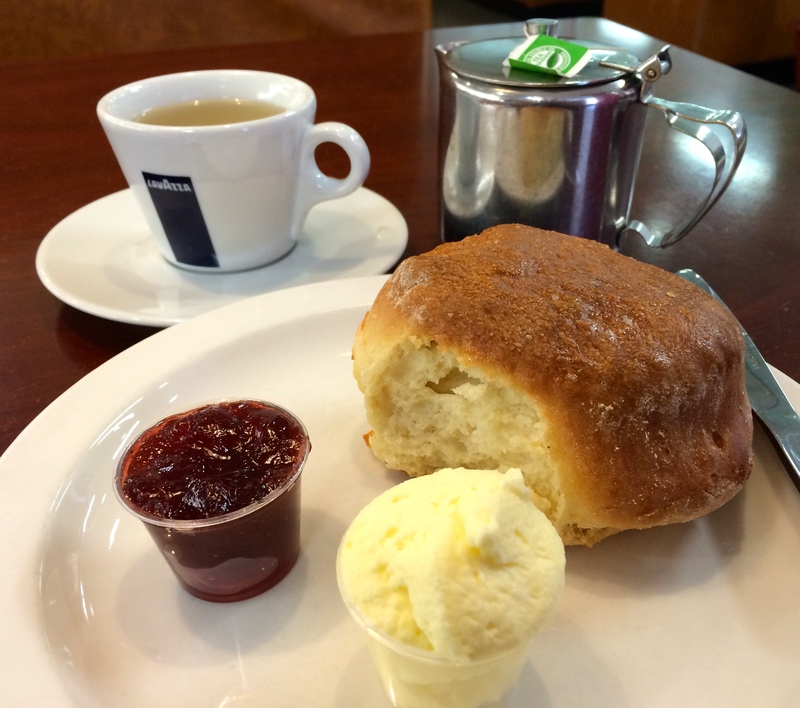 The scone on the other hand is far from enticing; more sweet bread roll than light fluffy scone. The jam is at the better end of the average spectrum but the cream is the star, fresh and thick. Go for the fun of it! Tea: A basic range of tea bag teas served in a small pot. Overall: A nostalgic trip down memory lane.